question_answer1) The figure given below shows a bottle with hot water when placed in is water taken in a glass trough undergoes change in its shape. Why does the bottle change its shape? question_answer2) Ravi inflated 4 balloons as shown below. What property of air can be proved from the given figures? question_answer3) Which gas in the air is represented by Part A? It takes the shape of the container that holds it. question_answer5) In which of the following processes is oxygen used up? question_answer6) An experiment is carried out by a group of students and their results are shown in the given figure. 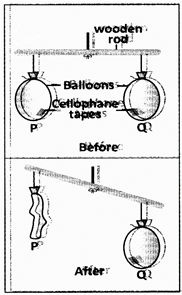 question_answer7) Two balloons are filled with air and are tied to a wooden rod. Balloon P is pricked through the cellophane tape. The figures show the situation before and after balloon P is prickled. What can you conclude from the above activity? (iii) Air has no fixed shape. question_answer9) Which of these protects us from the harmful rays of the sun? question_answer10) The pie chart shows the composition of air. What do x and y represent? question_answer11) The table shows the percentages of gases x, y and z. What change would you expect if exhaled air was tested? (i) The percentage of gas x will increase. (ii) The percentage of gas y will remain unchanged. (iii) The percentage of gas z will remain unchanged. question_answer12) What is present all around us? question_answer13) The figure shows two condense milk tins p and q, with one hole and q with two holes. It was observed that milk flowed out faster from Q than from P when tiled. Why? question_answer18) Which of these gases is present in a very small quantity in air, and is very important to plants? question_answer22) Which process is responsible for the formation of water vapor? question_answer25) What is shown by this experiment? question_answer27) Which of the following is the importance of the layer marked 'X' in the figure given below? question_answer28) Study the figure given below. Which of these is most important for making a fountain as shown in the figure? question_answer29) Which of the examples shows that air exerts pressure? question_answer30) Containers P and Q are placed under the sun for 4 hours. The water level in container Q dropped by 5 cm while the water level in container P dropped by 2 cm. What are the factors that caused the difference in the water levels of the two containers? question_answer32) Which of the following statements is true? (ii) Air is needed for burning. (iii) Air has no mass. question_answer34) Rishi placed a straw inside a beaker of water. He then closed the top of the straw with a finger and removed the straw from water. What did he observe? question_answer36) The table shows the mass of a balloon when it is inflated and when it is deflated. What inference can you make from the results shown? question_answer37) Which of the following shows the correct percentage of the composition of air? question_answer39) Which of these will dissolve in water? question_answer40) Jaya took a glass of water and added a spoonful of sugar and then squeezed the juice of a lemon into it. She stirred it well and then poured this mixture through a strainer. What will remain in the strainer? question_answer42) Which of the following processes allows insoluble particles to settle down in a solution? 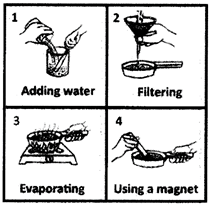 question_answer43) Which of the following shows the correct sequence in the evaporation of water? question_answer44) Shown here is the picture of an ink filler. When the ink filler is dipped into a beaker of water and the bulb is pressed, air bubbles appear in water. Why does this happen? question_answer45) Shyam is trying to separate a mixture of iron filings, sand and sugar. In which order must he perform the following steps?